Well, you've found them! If you are wanting to learn the piano or keyboard but don't have the time or money to commit to private lessons, you'll find the piano lesson reviews on this site an invaluable resource. Learning to play the piano from the comfort of your own home is a very rewarding experience. On this site, we take a look at the very best (and worst) in online piano lessons available on the internet. We've written detailed lessons reviews so you'll have all the information you need to make smart, informed decisions. 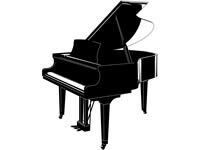 We encourage you to read our full reviews for any piano course you're interested in. 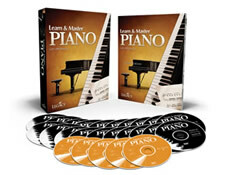 If you are any kind of a visual learner, the Learn and Master Piano DVD course will interest you greatly. The course itself is amazingly produced, and includes 14 professionally mastered DVDs, 5 Play Along CDs, as well as a 100+ lesson book that guides you through everything you see in the course. 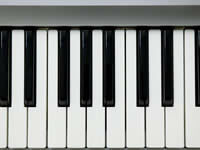 At the top right of this page, you can see a complete listing of all the piano lesson software reviews on our site. Our Editor's Choices: Learn and Master Piano is our top choice overall, as well as the best DVD piano course on the market. We have never seen such a comprehensive piano lesson package before. If you can't afford in-person piano lessons because of the cost, you won't find a better solution than Learn and Master Piano. True it is more expensive than other piano courses, but no other package is this comprehensive. Read our full Learn and Master Piano Review for more details. 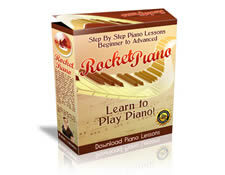 The popular Rocket Piano course on the other hand, came out on top in our low-cost category as well as our downloadable course category. It outperformed many higher-priced lessons such as Mr. Ron's Music Piano course. If you are on a budget or want to get computer-based piano lessons, this is your best bet. We also reviewed several other piano courses and software that unfortunately didn't make our short list of recommended piano lessons. It's not uncommon for you to see these other courses promoted on other websites, so it's good to realize that other website owners usually have advertising arrangements with these course owners. 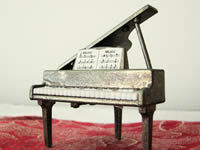 In general, we were disappointed with what other piano products offered. Most of the courses we ranked 3-5 lacked substantial multimedia elements, were shoddily put together, and didn't have much to offer in terms of lessons. We would advise you skip over these courses for one of our editor's picks. What are the differences and which one should you choose? Explains what to look for when buying a keyboard. As an independent, unbiased product review site, we take great pride in the integrity of our editorial reviews. In the interest of full disclosure we want our readers to know that we do receive review copies of all products and services we write about on this site. We also do receive commission on some, but not all product we review on this site. Please rest assured that we do not allow this to get in the way of our editorial process. We also want to point out that we do not accept paid reviews as we wish to maintain an unbiased perspective. Finally, we do not have a personal interest in any of the products we've reviewed and are not owned by any company whose products appear on this site. Thank-you for reading! Welcome to PianoSoftwareReviews.com, where we have a passion for music, learning and helping people achieve their full potential in reaching their educational goals! We are a 5 year-old consumer research site that has thoroughly searched the internet to discover are the best piano courses that are currently out there. This site reveals our findings. We receive compensation from the companies who's products we review. Each product reviewed has been thoroughly tested by us. The opinions offered here are our own and all information is verified as accurate at the time of review. If you have previously used any of the piano courses we've reviewed on this website, please share your experience with us and our readers!